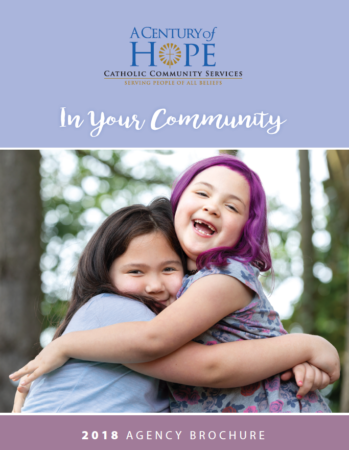 The Snohomish County Family Center has been responding to the needs of the community since 1942, when it was known as the Catholic Children’s Bureau which offered two programs in the community: Foster Care and Adoptions. When a community needs assessment process was undertaken in 1981, those needs changed resulting in the growth into the current multi-service family center located in Everett, Washington. The center’s definition of success is found in its philosophy, which embraces individualized, needs-driven, strength-based services. This philosophy shapes and affirms our partnership with the individuals, families and communities that we serve. Our mission is to serve men, women and children who come to us for assistance, with compassion and understanding while supporting and promoting self-sufficiency. We believe every child should grow up in a safe, loving, nurturing environment, in joining with others to change systems which oppress, discriminate or otherwise cause human suffering, and to work towards affirming and supporting a healthy family life. Provides case management services to individuals with mental health illness incarcerated within the county. The focus is to reduce the risk of recidivism and to safely transition the client into the community upon release from incarceration by linking the client to appropriate ongoing services and benefits as needed. Examples of assistance include: help in obtaining DSHS medical coupons, available housing, medication, and referrals to appropriate community resources. This program is referral based thorugh the jail system. Layette Services provides low-income parents with basic supplies for needs of newborns, as well as referrals to other community resources. Families seeking these services are either self-referred or referred by public health nurses or other state and agency providers. To access services, please call: (425) 257-2111. CCS provides parish counseling in conjunction with St. Hubert’s Church on Whidbey Island, which includes individual, couples and family counseling. To access services, please call (425) 257-2111 or (888) 240-8572. Serves to identify and assist individuals who live in Snohomish County and are at risk due to mental health illness of hospitalization, incarceration, or recent crisis episodes without services, and have no means of paying for services. The goal of the program is to assist those clients with applying for appropriate benefits and/or linkages to ongoing community based care. To access services, please call (425) 374-6358. This is a scattered site housing program that provides goal oriented intensive case management to maximize housing retention and self-sufficiency for pregnant & parenting women who are or have a history of substance abuse. Upon successful completion in our program, assistance is also provided in obtaining permanent housing for these families. If you are interested in becoming a volunteer, please call us at one of the numbers above and ask for a volunteer recruiter, or email us. Click here to view and download our Snohomish and Island Counties brochure.